William B. Hanley has been representing individuals and businesses in various shareholder and partnership disputes, such as contract disputes, since 1974. In many of these cases, the issue lies within the business relationships among equal partners or other shareholders. The business relationship may have run into problems, resulting in confusion or disagreement about the roles or expectations defined in previous contract agreements. There may be a minority shareholder that is being socially mistreated or disrespected in the workplace. In family-run organizations, there may be confusion regarding work titles and contractual responsibilities. It may not take a lot for business partners to find themselves with a dispute case on their hands. As a small business becomes more and more successful, the stakes for each shareholder becomes higher and higher, resulting in more stress and tension for everyone involved. When business relationships become strained, counseling can be necessary to avoid potential further issues such as breach of fiduciary duty. 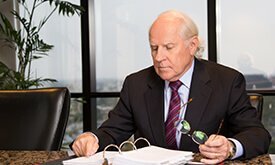 In cases requiring litigation, Attorney Bill Hanley provides efficient representation for clients regarding breach of fiduciary duty, shareholder oppression, wrongful termination, breach of contract, and other cases. There is an avenue open to resolve the disputes and there is a method to resolve it. When your business partners disagree about important business issues, an experienced attorney can help you work through them. Contact Bill Hanley’s office today for more information on how he can help you and your business.